There are always those few races that hold special meaning for you. This is one of those races. I ran my very first 20 miler on the course when I was training for my first marathon (I look back on this now and wonder WHY in the world I did that - it's NOT an easy route when you're running the first half uphill - and not only that, but I did it in December in 12 degree weather on packed snow in Yak Tracks - but that's neither here nor there). Anyways - I just LOVE the San Juans and more specifically Mt. Sneffels is my favorite peak profile (as in - I love looking at the Mountain - hiking it on the other hand, not so perfect (tough! ), but that's once again, another tangent I don't need to go into). It's just a very pretty mountain that I've been in love with since we moved to Montrose in 2011. Not seeing this mountain every day is really the main thing I miss since we moved to Grand Junction. Thankfully it's not THAT far, so I can deal so long as I get up here every so often. I did the race for the first time "officially" last year (I say "officially", as I had ran the course before in training - not illegally on race day or anything), and had a great time, so needless to say, I signed up again this year right when registration opened in February. 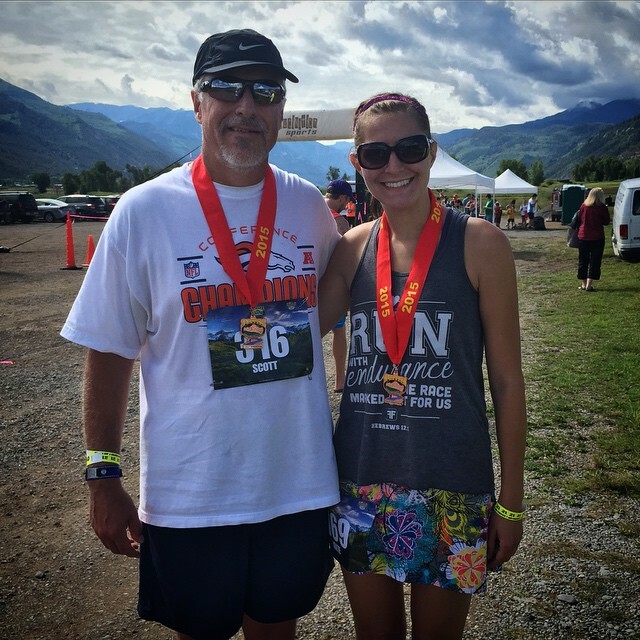 At the beginning of the summer my dad told me he wanted to take the plunge and do his first Half Marathon. He had asked about recommendations and so I threw this out and much to my surprise, he decided to do it (surprised since it's 6 hours from the Front Range where he lives). It's a beautiful course so it makes for a good runcation though - I hope he agreed! We headed down to Ouray mid-afternoon on Friday, stopping in Ridgway so I could show my mom where the finish line was (the course runs from Ouray north to Ridgway). The closer we got to Ouray, the more iffy the weather looked. Of course, I had packed NO rain gear (SMART). 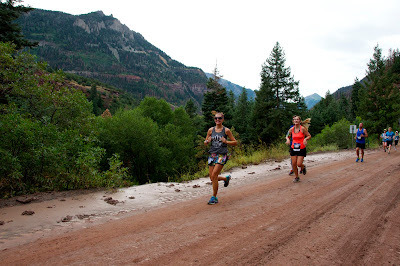 We made it a little after five, picked up our race packets at Fellen Park and then headed over to check into our hotel before going to grab dinner at the Ouray Brewery. We loved these glasses at the Ouray Brewery: "What Would Jesus Brew?" Once back at the hotel, I laid out "Flat Kate" and then relaxed for a bit before heading to bed. The race started at 7:30 the next morning, so I really didn't need to get up until 6 which was nice (that is LATE for a race - of course, being walking distance from the start doesn't hurt either). The race starts right on Highway 550, so they generally wait until about 10 minutes before to let you line up. We snapped a quick picture with my mom and then gathered with the masses (and by masses, I mean about 600 people) before the gun went off. I knew I didn't have much of a shot at a PR given I was only 3 weeks post-marathon and the fact that my Half PR is on a VERY downhill course, so my race strategy instead was going to be for a steady effort with the majority of my miles at goal marathon pace. It starts on an uphill, so I figured I would ease into the race with a slow warm-up mile and then settle with 8:00-8:10 miles for the remainder. This KIND OF worked. As I expected, mile 1 was a slower one at 9:21 - but not too bad and I love the first mile as you run down the main street in Ouray. It's really pretty, plus you get to see the faster runners coming back down which is nice. I waved at my mom as I headed back down the main street before getting onto the dirt County Road for the remainder of the race. Not even 2 miles into the race and something wasn't feeling right in my stomach. LOVELY (as this was my problem with my last race!!). I once again, don't really know what it was - I just felt kind of queezy. It wasn't terrible though, so I continued through it - but was hesitant to take anything other than a little bit of water. I also didn't carry my own water for the first time in a long time at a race - my goal had been to practice drinking from the cups while maintaining a decent pace - it actually went OKAY (this has been my biggest problem - I'm just no good at it - but of course, if I don't practice how will I ever get better?). So despite the little bit of stomach queezy-ness, I managed some pretty consistent miles through about mile 9: 8:03, 8:07, 8:07, 8:09, 8:08, 7:56, 8:07, 8:16. Official Race Photo - they were free this year! It was also during this section that my stomach really started bothering me to the extent that it started to effect my pace and I slowed by a considerable amount. Mile 10: 8:47. Still, I continued on as best as I could, finished the out-and-back section and then headed toward the dreaded Mile 11 hill. It's really not THAT bad of a hill, but you can see if for a long time, so it makes it feel worse than it is. Add to the fact that my stomach was a mess, and it resulted in me walking it. Meh - whatcha gonna do? It wasn't a "goal race" for me - so might as well. But it also resulted in my slowest mile of the day at 9:59 (still under 10 though - so practically a win!). After the last "big" hill, you get some nice downhill for a bit, so I managed some okay miles despite still not feeling great: 9:13, 9:06. I finally picked it up when I could see the finish line area and did the last .1 at an 8:12 pace, finishing the race in 1:52:58 - not too shabby considering the last few miles, but still not quite what I was going for. Which is why I was pleasantly surprised to find out that I also got 3rd place in my age group!!! It also always shocks me how much more competitive the 30-40 age groups are though - as a friend of mine who ran faster than me by several minutes was 8th in the Women 30-34 group (so the moral of this story is to just plan on never turning 30 - capisce?!. After catching my breath and attempting to feel better (although that really didn't happen until I sat down in the beer garden later on (go figure? ), I found my mom and we hung out at the finish line waiting for my dad to finish - which he did in an awesome time of 2:07:02! My dad finishing his first Half Marathon! We then celebrated with some pre-10:00am beers, took some pictures, and then headed back to Ouray for a quick dip in the Hot Springs before heading back to Grand Junction! I've kind of mentioned it already, I really like this race. It's a beautiful scenic course that's fairly fast (aside from the few hills, this is a net downhill course). It's a great size at about 600-700 finishers in the Half and about 100 or so in the Full. The Full is an out-and-back, so not so fast - but I would like to do it someday! I love all of the swag - nice tech long sleeve shirt (last year they were short sleeves and it didn't fit me real well - I think this years will be better), the drawstring bag, and the finisher's medal - all with Mt. Sneffels on this (love that!). The bibs are also really nice in full color with Mt. Sneffels and personalized if you sign up early enough. They also had pint glasses for sale - so I, of course, had to get one to go along with all of my other Mt. 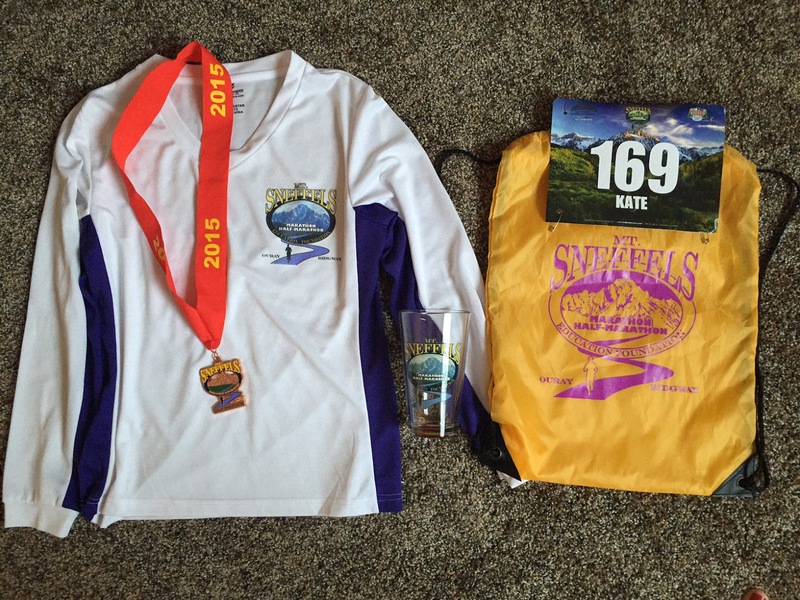 Sneffels stuff (plus I have a nice collection going of race pint glasses now - about 9 or so). Your race fee also includes a free beer at the finish line and a coupon for 1/2 price into the Hot Springs. Last, even with all of that, the price for the race is still really good - early bird registration in February was only $45.00. The only negative thing I'd say is that the road is dirt - so if it rains a lot this could be a problem. In fact, it almost was this year. As I briefly mentioned, it rained A LOT on the day before the race - even so much so that it caused a mud-slide and the race almost had to be moved (both the time and the route). Thankfully it was cleared in time - but the road was still fairly beat up in spots because of this (the weather ended up being PERFECT running weather by the way! 50's and low 60's and the sun didn't come out until right before I finished). As far as this specific race went, despite my stomach issues (and just being bummed in general that this is my second race in a row of that), I really did have a great time and was glad I got to share it with my dad and see him finish his first Half Marathon! My first half was such a big accomplishment for me, so I'm so proud of him for doing it! Kind of a no-brainer, but YES! 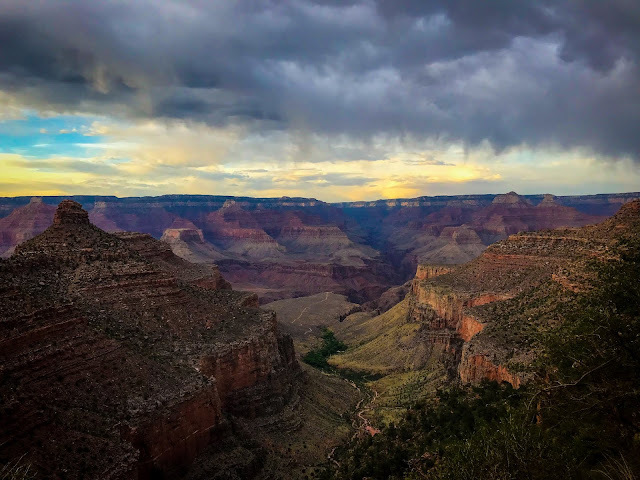 I'm not sure if I'll continue to do it every year, but it will definitely happen every so often - especially as long as I'm still on the Western Slope. 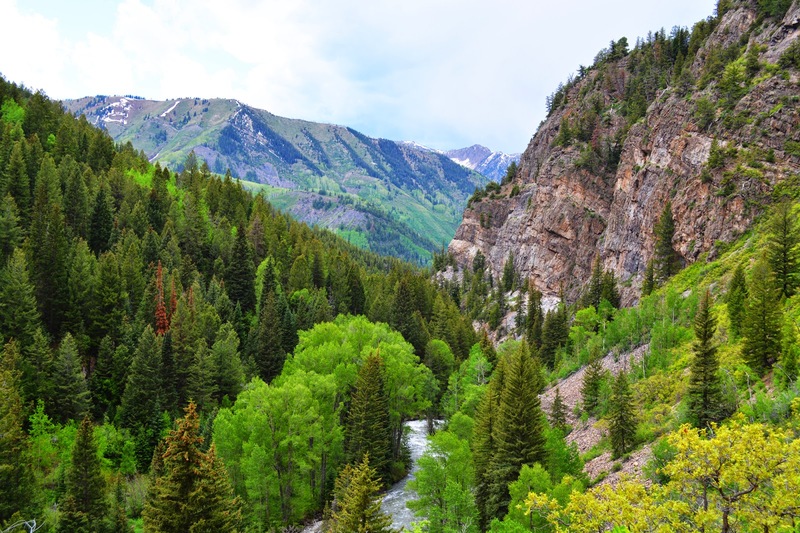 As I mentioned, I really like it, and besides, I'll take any excuse to go to Ouray! The Sneffels Range - unfortunately it was cloudy, so you couldn't actually see the mountain this race was named for that day - but I know it's there! Kate, My name is Chris and I teach graphic design at Ridgway Secondary School. One of my students would like to have permission to use your Mt. Sneffels image you have at the top of this blog for a bumper sticker she is designing for our school district. Would you mind emailing me at cshima@ridgway.k12.co.us as your earliest convenience? Thank you so much!